Glenda’s 100th Random Amusing Challenge! This week Glenda is celebrating her 100th Amusing Challenge and she has asked a bunch of her buddies (including lots of us from the old A Muse team) to play along in a blog hop of sorts. There’s lots of great cards to see, so scroll down below my card to see everyone’s creations! Glenda’s 100th Challenge is: Use red on your card or project. Use as much or as little as you like. Incorporate it by using paper, ink, ribbon, embellishments, whatever you like! It’s that simple! You must play along with the challenge to be eligible to win the blog candy. If you play along, please leave a comment on Glenda’s blog and link back to her post from your post. If you upload to an online gallery, please use the keyword GRAC100. You have until midnight Pacific Time on January 23rd to play along and you can play along as many times as you like. The winner will be randomly chosen and announced on January 24th. Have fun! I’m trying to make 10 Christmas cards per month this year so that I don’t feel too overwhelmed when November rolls around. 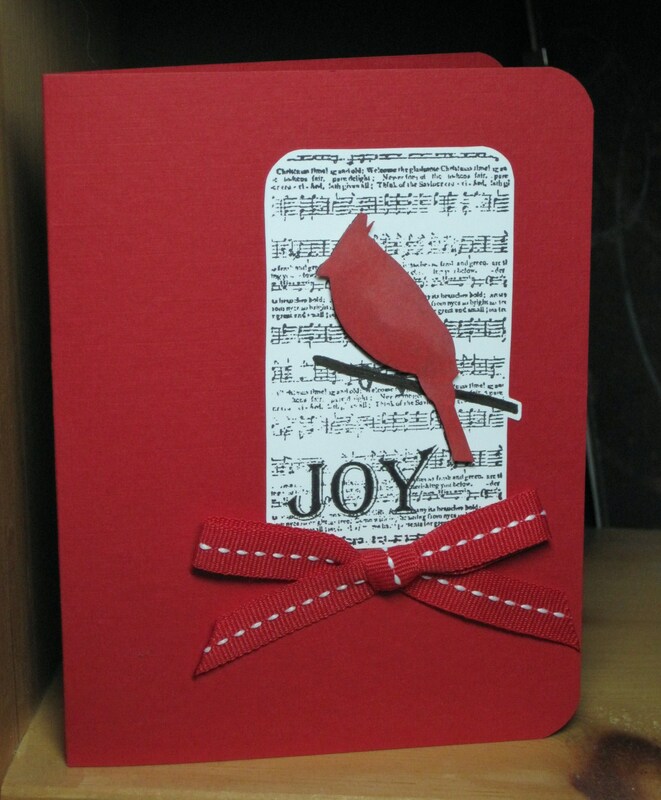 Here’s my design for January, which was super easy because the music notes, cardinal and sentiment are all ONE stamp! I stamped it once in black and once in red so I could cut out the red cardinal and layer over the existing black one with pop dots. Here’s a list of other bloggers playing along with the challenge! i love that music note background!!! Absolutely gorgeous. I love it! Thanks so much for playing along. Fab card! Love the birdie. Great card, and GREAT idea to plan ahead! Super CAS design! Love the red birdie! I always make my Christmas cards in advance. So glad you are too. Makes for a happier holiday for sure! That birdie looks great on the musical paper. Great card – love the bit of music.